Bioroids and Bombots: Weapons: TS Derringers. Originally derringers were designed to use a large-calibre bullet in a small weapon. During the twentieth century derringers were manufactured in a wider variety of calibres. In 2100 the most common models of derringer fire standard 10mm and 4mm caseless pistol rounds. The short barrels of these weapons reduce the effectiveness of these high-velocity rounds. Recoil makes follow-up shots slow and muzzle flash and noise is noticeable! 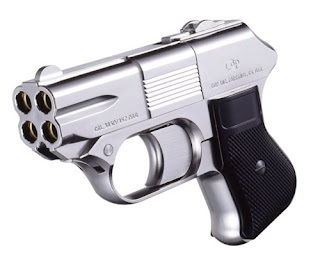 Four-barrelled versions with a passing resemblance to the COP inc pistol are also available.